TM Designworks is opening up their Rider Support program for 2019 to all applicants. Phoenix, OR (October 16, 2018) – Join the likes of GEICO Honda and the Factory KTM and Husqvarna Off-Road Teams in equipping your ride with the best quality products on the market. 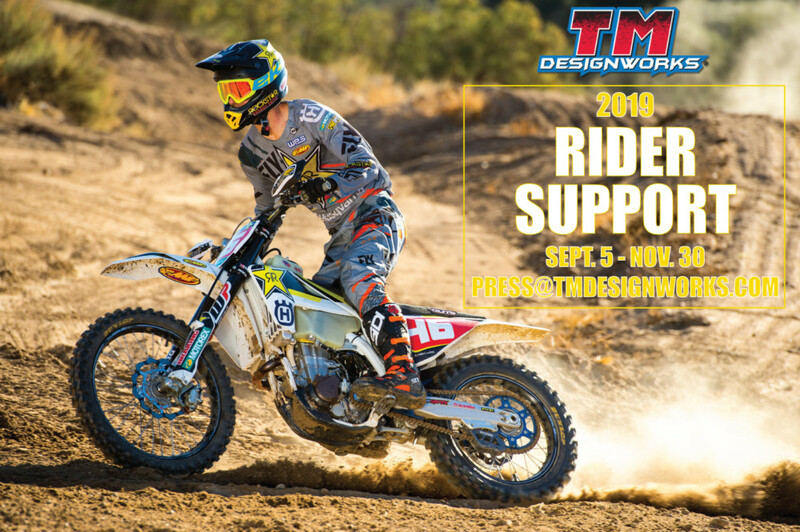 TM Designworks’ Rider Support Program is in full swing and accepting applicants to join #TeamTMD until November 30, 2018. Known for their signature Slide-N-Guide Kits along with Skid Plates, Rear Disc Guards, and more, TM Designworks produces performance products for most makes and models making you an ideal applicant. Join today and Slide-N-Guide your way to the top step of the podium! Are you primarily racing off-road, motocross, ATV, or UTV for 2019? What is the year, make, model, and size of bike/s your racing in 2019? Please include a brief summary of your 2018 season and what class you are racing. What are the goals you trying to achieve in 2019? We know what we can do for you. How are you going to promote TM Designworks brand name and quality parts to your local shop and competitors? For 2019, full support riders must run swingarm Slide-N-Guide kits, rear disc protector, and skidplate to qualify for sponsorships, except in MX or SX bike setups. For full off-road support, if you signed with xyz company swingarm parts, skid or disc protector, then your resume will probably be a low priority. For 2019 we have few off-road sponsorships left. Our program for Pro SX and amateur MX racers is wide open in this field from Mini’s to Vets. Please use press@tmdesignworks.com To send in your resume and race-support results. If approved we will send you a contract with details and guidelines for 2018 season. It is your choice to sign or just do not return the contract if you cannot comply. No matter what you do, TM Designworks wishes you all the best for the remaining season and all of 2019. Look forward To reading your proposals. Happy trails and Hole shots to everyone from staff at TM Designworks.